I did not visit De Ponte (“Duh Pawnt”) Cellars on my recent trip to the Willamette Valley, but I tasted several recent releases at home and was so impressed I wanted to highlight the winery. Being close to more famous neighbors like Domaine Drouhin Oregon, Archery Summit and Domaine Serene, this winery flies a little bit under the radar. I have visited the vineyard and winery in the past as part of the International Pinot Noir Celebration. Scott and Rae Baldwin acquired their Dundee Hills property in 1999 and started this small family winery in 2001, naming the winery after Baldwin’s grandfather, Manuel de Ponte, who grew grapes and made wine in California’s San Joaquin Valley. The Baldwins are immigrants from California where they owned a walnut orchard in the Central Valley and lived in Carmel Valley. 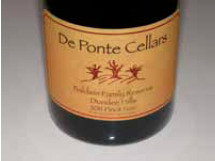 The De Ponte estate vineyard is planted to 20 acres of Dijon clone Pinot Noir and 2 acres of Melon de Bourgogne. The Melon grape has sparse plantings in the United States and was a mistake. The original growers thought they were planting Pinot Blanc grapes but it turned out to be Melon de Bourgogne, identical to the grape used in the Muscadet from the Loire Valley of France. The wine has turned out to be very popular. 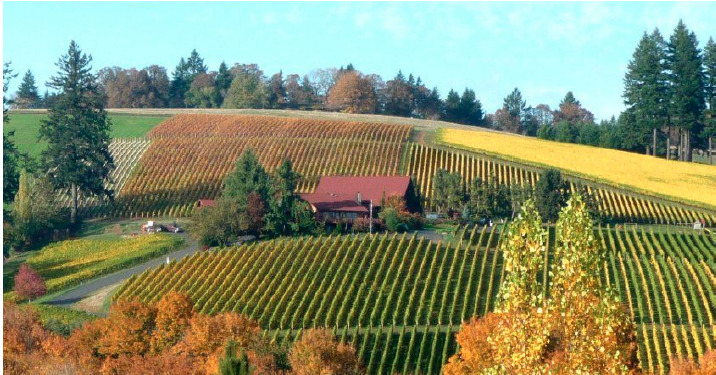 In 2007, the Baldwins bought 80 acres with an existing 6-acre Pinot Noir (667 and 777) vineyard on the western edge of the Yamhill-Carlton AVA. Named Lonesome Rock Ranch, another 2 acres of Pinot Noir were planted in 2010. This site is exposed to more weather extremes than the De Ponte Vineyard. The soils are rich, red volcanic Jory in type. The vineyard does not lie within the Yamhill-Carlton AVA boundaries, situated two miles to the west of the Yamhill-Carlton AVA border line and one of only three other vineyards within the Willamette Valley that are closer to the Pacific Ocean. A herd of steers roam on the property, graze on grass, and are fed pomace left over from De Ponte’s winemaking process. The beef is sold under the Lonesome Rock Cattle Company brand (wine club members only). The talented winemaker is Parisian-born Isabelle Dutarte who studied at the University of Bourgogne and has made wine professionally for well over 30 years. Her impressive resume includes winemaking stints like Maison Joseph Drouhin before she moved to Oregon in 1993 to assist the Drouhin family with Domaine Drouhin Oregon. Her mentor at Maison Joseph Drouhin was Laurence Jobard, the head winemaker with whom she worked for ten years. She became the head winemaker at De Ponte Cellars in 2001, moving permanently to the Yamhill Valley five years later. Shortly after, she also founded her own label, 1789 wines. The winery has two tasting rooms. The original winery tasting room is located in the heart of the Dundee Hills at 17545 Archery Summit Road and is open daily. The newest tasting room is located in historic Carlton just off Main Street and is housed in an old firehouse. Known as the Lonesome Rock Firehouse, it is open for tasting Friday through Sunday 12:00-5:00. The website is www.depontecellars.com. The 3-bedroom De Ponte Cellars Vineyard Retreat, located on the property with views of the Willamette Valley and Mount Hood is available for rent. A concierge can be arranged and a chef provided to prepare meals. The 2,000 bottle De Ponte library wine and international wine list is available to guests.